We are proud to present the winners of the I-COM Data Startup Challenge (previously known as the I-COM Data Venture Challenge). This Global competition showcases top startups which have Data & Measurement services as their primary business, serving the Digital Marketing Industry. The Official Selection finalists presenting at the I-COM Global Summit 2018 for the final round of judging. The Official Selection finalists presenting at the I-COM Global Summit 2017 for the final round of judging. See presentations from the Official Selection finalists presenting at I-COM Global Summit 2016 for the final round of judging. VMob is a team of people that are passionate about technology and innovation, which saw a massive opportunity for retailers to be making use of the advantages that mobile affords them. Special Corporate Award by the Unilever Foundry. A NEW element of the Venture Challenge is the Special Corporate Award by the Unilever Foundry. The winner is Shareablee. 3) A pass to the Cannes Lions festival as part of Unilever’s delegation. See presentations from the Official Selection finalists presenting at I-COM Global Summit 2015 for the final round of judging. Congrats to RealEyes UK and their CEO, Mihkel Jäätma, for being selected by both the Jury and Audience as Overall Winner of the I-COM Big Data Venture Challenge. Pictured from left to right: Andreas Cohen, I-COM Chairman, Switzerland - Competiton Sponsor, Scott Hagedorn, CEO, Annalect, USA - Mihkel Jäätma, CEO, RealEyes, UK. Realeyes is an online analytics platform that measures people's emotional response to media content via standard webcams. Realeyes enables brands and agencies to really understand the impact of their creative and maximize media spend. The platform has become a powerful tool for research agencies such as Ipsos, media publishers like AOL and creative agencies like Havas Media to make profitable marketing decisions for many Fortune 500 brands. Realeyes was founded at Oxford University and has grown in to a global company with a London HQ, an R&D and technology team in Budapest and sales offices in New York and Boston. It was worth the long trip from New Zealand, as VMob, CEO, Scott Bradley accepts the trophy for winning the Emerging Market Regions Category for the I-COM Big Data Venture Challenge. Pictured from left to right: Rome Winner, Kevin Tan, CEO, Eyeota, Singapore - Andreas Cohen, I-COM Chairman, Switzerland - Competition Sponsor, Scott Hagedorn, CEO, Annalect, USA - Scott Bradley, CEO, VMob, New Zealand. New Zealand based Mobile Marketing provider VMob gains international recognition for their innovative use of big data in the I-COM Big Data Venture Challenge in Seville, Spain. VMob uses mobile to put shoppers back into shops and increase sales for bricks and mortar retailers. VMob CEO, Scott Bradley received the award at the packed hall at the Real Alcazar on Tuesday night local time competing against twelve other finalists from seven countries around the globe. Through sophisticated data analysis and a combination of product and customer modelling, Clear Returns identify the causes of returns and, more significantly, the customers most impacted. This means their clients can minimize the negative impact of returns on the business and their customers, without hiring an expensive data science team. Clear Return’s award-winning returns intelligence platform merges key data from ecommerce, stores, and warehouse systems to provide a consolidated and predictive view of the impact of returns on overall performance, along with prioritized, actionable outcomes. This means marketing, customer service, content management and even buying and discounting decisions can be based on intelligence that will grow keeps and therefore grow profits. eyeota, CEO, Kevin Tan, Singapore is the winner of the Emerging Market Regions Category Award. 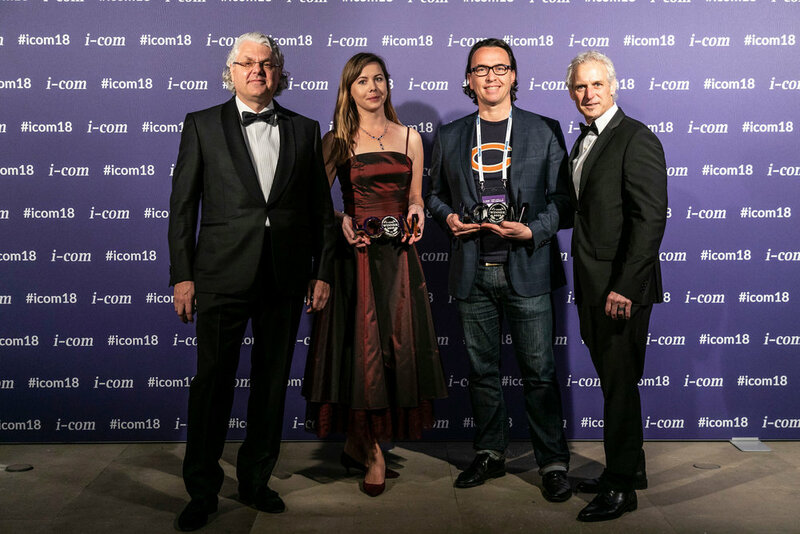 Pictured from left to right: Andreas Cohen, I-COM Chairman, Switzerland – EMR Winner, Kevin Tan, CEO, eyeota, Singapore - Alain Couttolenc, Head of Media, Nielsen in Europe. eyeota combines global advertising, publisher monetization, analytics, and market research talent with cutting edge data technology. eyeota's management team is seasoned in the world of international ad sales and data management. Drawing on experience in international markets from Asia, Europe, and Australia to North and South America spanning the last 3 decades. eyeota helps publishers build and segment their audience data and then monetize it through the eyeota data marketplace. They do not sell advertising and are inventory neutral. eyeota helps data owners maximize their audience data revenues and help data buyers find the audience they want on their choice of inventory and maximize their campaign results.